Public Speaking ― What Not to Say! You have great content for your listeners. You're prepared and ready. So why spoil your presentation by using words that can weaken your influence? 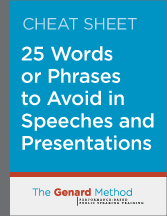 Learn the words and phrases on Dr. Gary Genard's cheat sheet that will get in the way of success. Use this list to say the things that will help you, and avoid the ones that won't.